As I write this, I am in Nova Scotia, looking out at the ocean and relaxing in the fresh salt air. It is hard to believe that by the time you read this article, summer will be a distant memory and the busiest time of the year will be upon us and celebrations, shopping and of course decorating will be our focus. I have to say, I was challenged to write given my state of relaxation! It was difficult to find inspiration for an article for the sunset of the year when I was enjoying the stunning ocean sunsets in one of Canada’s most beautiful provinces. But as I was beach-combing, it struck me that one of the easiest ways to decorate for the Christmas season is the use of natural elements. Besides keeping us grounded to our surroundings and being works of art in and of themselves, natural elements work well in most décor styles and are not so season specific they need to be put away as soon as the celebrations are complete. Many of us are simplifying, down-sizing or celebrating Christmas in different ways than we have in the past, escaping the insanity that can overtake us as we are bombarded by the media. In speaking with family and friends, there is a trend to simplify and refocus celebrations on what is really important and enjoy time spent together creating new memories. Pinecones are plentiful in the fall, are readily available and perfect for Christmas decorating. I love a bowl or small wooden tray of pinecones mixed with some small grapevine stars, cinnamon sticks, candles and even a few stones.Hurricane vases of varying sizes filled with pinecones, nuts and cinnamon sticks also make a beautiful display and can be used as a centerpiece, mantel display or on a coffee or side table.A small bowl of mini pinecones combined with nuts and a few cinnamon sticks also makes a lovely addition in your bathroom or guest room. Stones work any time and in any décor — just ask my husband! No vacation is complete without me finding some interesting stones or rocks that just have to come home! 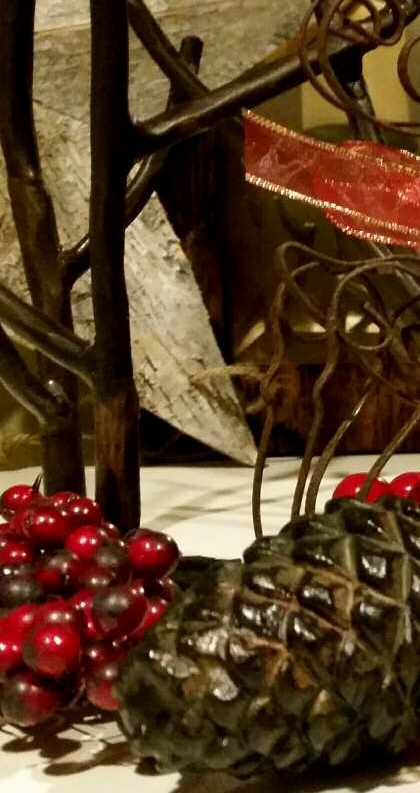 I love displaying stones in a dish, shallow wooden bowl or tray or a hurricane vase surrounding a candle and mixed with pinecones, nuts, dried cranberries and cinnamon sticks. I sometimes add a few sea shells into the mix which provide additional texture.A small wooden tray or shallow wooden bowl also makes an interesting and simple container for displaying these items and is suitable as a centerpiece on the dining table or coffee table. Today grapevine is available in a number of shapes and sizes. Not only does it come in the form of wreaths but also in the shape of gourds, stars, etc. Grapevine stars look festive hung from the light over a dining table or from cabinet and drawer knobs.They also add a cheery note when set on the top of a basket of napkins or simply set along a window ledge. A simple string of mini lights (which are available in star shapes) around a wreath makes a simple festive item and can be hung inside or out or set atop a cabinet or mantel leaning against the wall as the anchor of a vignette. In this instance it can be surrounded by hurricane vases of pinecones, jars of nuts and dried cranberries mixed with cinnamon sticks and dried anise.This makes for a lovely natural scent in your home too! In our home, one of the first signs of Christmas is a beautiful yet simple red glass bowl with gold leaf embellishments that I fill with clementines which makes an eye-catching contrast of colour.When our girls were growing up, the appearance of this bowl with the clementines signaled the start of the Christmas season and a time of excitement! Pottery bowls or wooden trays are equally striking when filled with clementines, oranges, apples and/or nuts and can be placed on a dining table, kitchen counter, coffee or side table. Fresh greenery, in particular pine boughs and dried dogwood branches, are very popular at Christmas and can be used both indoors and out. Fresh boughs are readily available at any Christmas tree lot and there are some excellent imitation pine boughs available today that are less messy and do not require care to make them last through the holidays. Dried dogwood branches can be found at farmers’ markets, craft stores and even some of the larger grocery stores. The greenery and dogwood can be equally elegant in a tall glass vase with some sprigs of red berries and mini pinecones or stones in the bottom to anchor them.Also consider laying the greenery on a dining,side or coffee table interspersed with sprigs of red berries and/or the dried dogwood and pinecones and nuts or fruits tucked among the boughs. Ribbon wound through the branches adds another colourful dimension and can soften the look. I am a huge lover of candles, as they work so well for every occasion, are suitable to every decor style and are available in a wide range of colours. 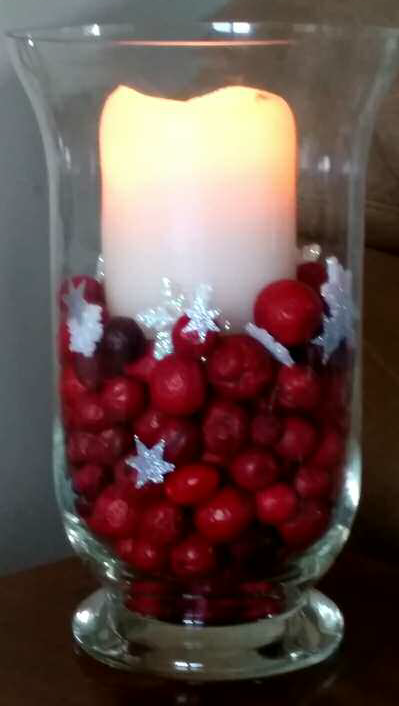 If you are concerned about the fire hazard, there is an extensive array of battery operated candles available that are very realistic looking and come in various colours and scents too. To reduce decorating time and money, I use cream coloured or white candles which easily adapt to the various seasons and celebrations. For Christmas they can be tucked into some greenery on a mantel with lovely plaid ribbon tied around each. If you don’t have a mantel, place the candles on a long narrow tray surrounded by pinecones and nuts, cinnamon sticks and anise for a lovely centerpiece on the dining or coffee table.A trio of candles of varying heights on a tray, a round mirror, or pretty plate placed on a coffee or side table can be very festive and again tying ribbon around them provides texture and colour and the addition of a few nuts or pinecones adds an extra bit of style. Remember candles work well in the entrance way, kitchen and bathroom too, and make a simple and attractive display when tucked in a hurricane vase surrounded by mini pinecones or dried cranberries. Janet Armstrong (www.simplyswankdecor.ca) is a graduate interior designer from the Interior Design Institute and member of the Canadian National Association for Decorators and Designers (CDECA). This entry was posted in Homestyle and tagged Christmas decorating, home decorating. Bookmark the permalink.